SAN JUAN, Puerto Rico – Puerto Rico nationalist Oscar Lopez Rivera was freed from house arrest Wednesday after decades in custody in a case that transformed him into a martyr with supporters but outraged those who lost loved ones in a string of deadly bombings. Wearing a black shirt and jeans, the 74-year-old grinned broadly and waved to supporters through a fence at his daughter’s San Juan home before getting into a white jeep. He was scheduled to stop at a federal building to return electronic tags that monitored his movements during his home confinement. Roughly 50 people congregated in the streets outside the apartment building in San Juan’s Santurce district holding flowers and Puerto Rican flags, some chanting: “Free at last!” A group of singers from University of Puerto Rico’s choir harmonized as Lopez drove past. A street celebration was expected to draw thousands of supporters later in the day. Lopez was considered a top leader of the Armed Forces of National Liberation, or FALN, an ultranationalist Puerto Rican group that claimed responsibility for more than 100 bombings at government buildings, department stores, banks and restaurants in New York, Chicago, Washington and Puerto Rico during the 1970s and early 1980s. The most famous was the still-unsolved 1975 explosion that killed four people and wounded 60 at Fraunces Tavern, a landmark restaurant in New York’s financial district. Lopez, a Vietnam War veteran who moved from Puerto Rico to Chicago as a child, wasn’t convicted of any role in the bombings that killed six people and injured dozens, but those who lost loved ones hold him responsible. “This guy was convicted of leading the FALN that murdered people,” said Joseph Connor, whose father, Frank, was killed in the Fraunces Tavern attack. While many Puerto Ricans support Lopez, those seeking independence remain a small group. The option garnered less than 6 percent of the vote in four referendums that Puerto Rico has held on its political status. Thousands of supporters were expected to celebrate Lopez’s release in Puerto Rico and he was to be feted in Chicago later this week. Supporters also plan to honor him at the June 11 Puerto Rican Day parade along New York’s Fifth Avenue. A campaign to free Lopez over the years has drawn support from Pope Francis, former President Jimmy Carter and “Hamilton” creator Lin-Manuel Miranda. President Barack Obama commuted his sentence in January. 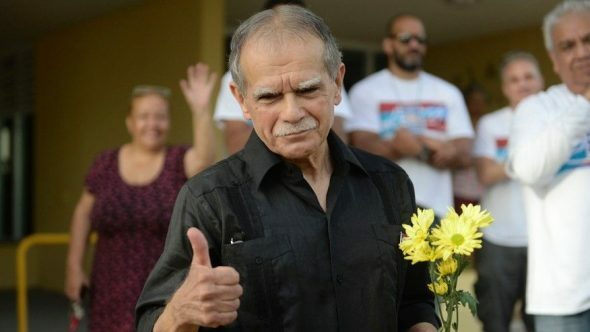 Less than a month later, Lopez was released from prison in Terre Haute, Indiana, and arrived in Puerto Rico to serve the remainder of his sentence under house arrest. He has been staying with his daughter at her home in the capital of San Juan. The United States seized Puerto Rico from Spain during the Spanish-American War. The island’s 3.5 million residents are U.S. citizens and serve in the military. The U.S. commonwealth receives billions in federal funds but people cannot vote for president and have no vote in Congress. Lopez has said that upon returning to Puerto Rico he wanted to spend time with family and create a think tank to work on issues including climate change, the economy and the island’s political status.